. : The Shocking Truth about Nationals! :: Ski XCOttawa.ca :: Skiing in Ottawa and Gatineau Park :. The Shocking Truth about Nationals! Team XC Ottawa pans for glory! Overall, I would classify the week as glorious. The venue, town and volunteers were welcoming and phenomenal. As with any team at Nationals, XC Ottawa had a mixture of poor races, good races and great races but the good races definitely outweighed the bad. Also, huge congratulations should be sent out to Nakkertok who took a decisive win as top club in Canada! Below are notable XC Ottawa performances. Megan and Anna and a great view that this picture does not due justice. The week started with the team sprints. XC Ottawa posted one team with Megan and Sheila who made the finals and finished up 7th. Fellow XC Ottawa team mates competed in the CCUNC relays. The guys slicked back their hair with gel for increased aerodynamics much to the shock of the girls on course. It must have worked as Colin and Stephan finishing up first. Alana and Adele, in their matching buffs, took charge from the get go in the women’s CCUNC sprint to win by 17 seconds! The second day moved us into the short distance classic. Many of us found this day difficult; however, Alana pulled through for the team posting an 11th. With the short distance race behind us we headed into the next day’s skate medium distance race. This was a strong day for the most part with strong results in both men’s and women’s events. Notable results of the day include Karl placing 19th, Megan 14th, Alana 15th and Kyle posting his personal best with an 18th in the junior category. This led us into the sprints with Alana, Megan and Sheila qualifying on the women’s side and finishing up 13th, 19th and 29th. On the men’s side, Colin was the only one to qualify in junior in 5th but he captured the crowd with a sweet crash during the heats. As the junior categories are so large now with the combination of the junior categories, they ran development heats for 30th to 60th places. Kyle and Lee competed in these, finishing up 36th and 39th. This left us with the distance race. Justin, who had been sick all week, helped with feeds and his cheers were gold as he told us all to have a “good show!” The Ultimate Man race, the 50km, was the first distance event. Karl posted an amazing 9th place! Matthias, competing in his first ever 50km, not only looked great but posted a 37th. On the junior side, Colin was 3rd, a very impressive result. It was a photo finish at the line after 20km and it was awesome for him to get a medal in his home town. Lee also posted a great result finishing up 23rd. The women’s side was no exception to the men’s as we raced around the 30km course. Megan had a great race finishing 12th Alana was 14th and Sheila finished up 15th in her best placing of the week. Anna competing in her favorite event and did well placing 26th. John Suuronen and John Langstone worked very hard all week to give us the best skis possible and at the end of the week I think they deserve the crown for kings of the wax tent! This week was an extremely successful week for the Carleton Ravens. Perhaps it was the abundance of Ravens in and around Whitehorse that made them feel at home. Not only did the men win the overall title but Carleton racked up nine CCUNC medals. Highlights included the men’s medium distance race where Carleton took up every spot on the podium and Adele and Alana’s decisive win in the opening team sprint. XC Ottawa finds its true match with dog sledding! As a side adventure we took an afternoon off and went dog sledding. It was something I will remember for a long time. It was very cool driving a sled behind a team of dogs down a trail looking out at some amazing Whitehorse views. We only had two spills and one or two tangle ups. It was a key experience that is not to be missed if you are ever in Whitehorse. Thanks to Nansen and his family for the great meal and the great ride! The last day many of the team went on a backcountry ski adventure! The photos have me wishing I was there too! 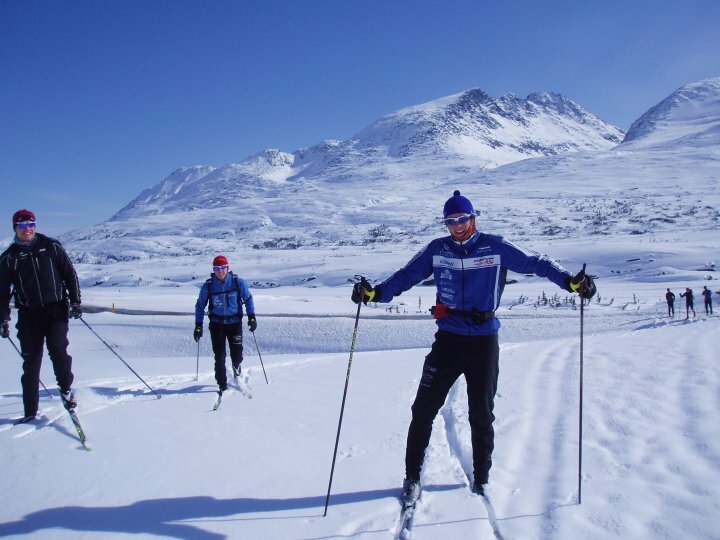 XC News: Why is a 70 year old Swede Roller Skiing Across Canada?